When they expressed a desire for a Woodleaf Studio piece Matthew toured the Schultz’s home with them. They had not been sure what they wanted, but following the tour when Matthew recommended a breakfast table for their kitchen they were sold on the idea. They wanted it to be functional, practical and casual. Matthew decided on a country-flavored design, which they approved. 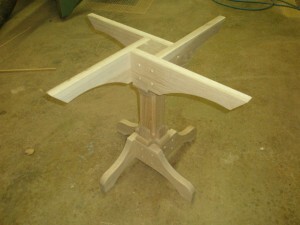 The solid white oak 48” diameter table seats four to six . Decorative buttons conceal the screws that hold the base together. 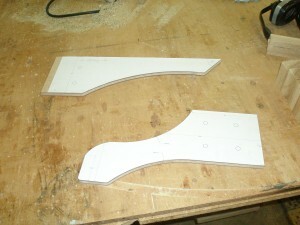 The planking of the top is deliberately accentuated to show the character of the individual boards. The finish is a golden oak stain with a semi-gloss lacquer. A handsome utilitarian piece!